Omniflex specialises in remote monitoring solutions based on years of plant networking experience from last mile networking to mainstream Ethernet backbones. The Teleterm range specifically addresses the remote outstation issue by providing a programmable platform IEC61131 languages for control and networking options from low grade cable to Radio and GSM infrastructure. Wireless distributed PLCs with inherent data acquisition capability are an attractive proposition against cable-based systems. Supervisory systems can also be wireless implementations through the use of WiFi. A tablet can be used as a portable operator interface or management tool for linking into the system without having to use fixed desktop computers. 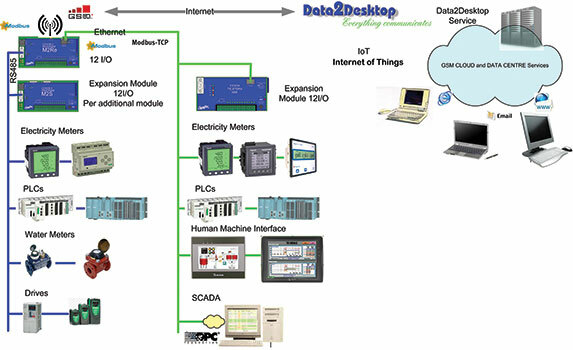 Remote site visualisation is achieved the same way using a tablet and remote Teleterm devices via the Internet and local routers integrating into the Internet. Omniflex’s IoT enabled Teleterm range and peripheral connection options.